From time to time we have been approached by customers wanting to use our essences, but without the cognac, and if in spray form, without the essential oils. For some people this is simply personal preference, and for some it is a religious matter. So after much reflection, we decided to make our entire range of 101 essences available in a stock-strength 30 ml (1 oz.) spray bottle. 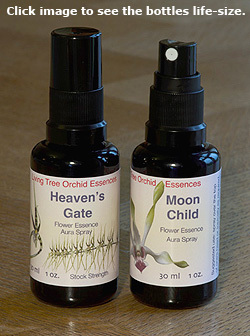 These sprays are made with just water (60%) and organic vodka, and the drops of mother tincture which are added to that mix. The vodka we use for these sprays is 55% alcohol, so the sprays themselves contain 22% alcohol, which means these are very capable of being stored for many years by therapists, just like our cognac-based stock essences in the 15 ml dropper bottles. Since putting word around about these sprays, we have had very welcoming comments from animal healers, massage therapists, kinesiologists, homeopaths and others. 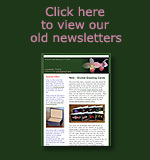 In effect this is a new manner of enabling the essences to reach out into the world, and we hope our customers enjoy them! We should mention that these stock-strength 30 ml sprays are not really competing with our existing larger aura sprays, at the very least due to the fact that the existing aura sprays all have various essential oils in them, while these 30 ml spray do not. Therapists are likely to find many new ways to make use of these stock-strength sprays, and we look forward to hearing of these different uses and approaches in the years ahead. To give one interesting example, an animal healer told us that when she works with a horse at a distance, she in some manner creates a half-size 'holographic' image of the horse, and this enables her to tune in more deeply to the issues the horse is dealing with. 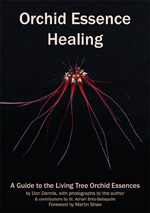 The healer was excited to learn of these new sprays, as she will now be able to send the healing energies of the orchids to the horse by spraying that holographic image. In this instance one can see the clear advantage of the spray over that of the drops. 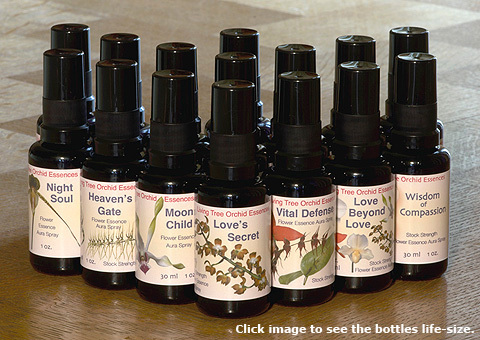 On both the Single Essences page and the Combinations page, you will now find a choice of two buttons, so that you can select the traditional (15 ml) drops, or the new 30 ml spray form of each stock essence.